See, that's all there is! It’s not writing any old haiku that’s the issue, though: writing something with meaning’s much trickier. 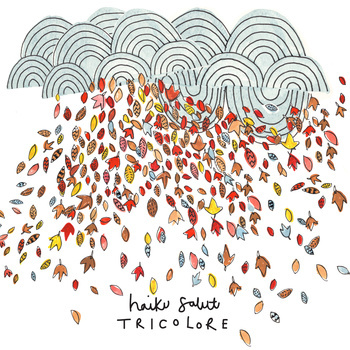 Fittingly, experimental instrumental folk-pop trio Haiku Salut’s debut, Tricolore, is essentially a literary exercise, an attempt to play with the elements of music and dig into the science of feeling. Sure, that may sound unbearably stuffy, but to the band’s credit, its debut feels more like a grab bag of trinkets than a dissertation on the limbic system. The first treat to be found here is the sheer variety of instruments. Haiku Salut utilizes piano, harmonica, accordion, percussion, synths, guitar and even hints of hip-hop vocal samples, dabbling in macabre folk in one minute before bursting into a spontaneous nightclub party the next. The structure of the songs, too, packs in as much as possible: each is a micro overture in its own right, with smaller movements buried within it. It’s hard to believe the album is only 38 minutes long when there’s so much going on, yet the time will fly faster than most will notice. Beyond its charmingly whimsical surface, though, Haiku Salut demonstrates a sophisticated understanding of how the bells and whistles fit together. Opener “Sounds Like There’s A Pacman Crunching Away At Your Heart” is a primer for the rest of the album: it begins in an ostensible haze, with acoustic guitar, piano and accordion circling each other, but gradually recognizable patterns begin to show themselves. That’s not all there is, though, as the song segues into a second movement where the percussion initiates a gradual accelerando and chunky 8-bit synths take up the melody. The song’s climax brings the old and the new together, where the traditional folk strains of the first half and the more modern influences of the second dovetail: it’s a scrapbook of a song, compiled from little snatches of diary entries and photo booth snapshots, but it feels all the more significant for how much depth it finds in the little trifles which make it up. The band also has fun playing with genres, often throwing disparate influences together to display complex emotional states. “Los Elefantes” throws together a dark piano waltz straight off the soundtrack for Amelie before evolving into a frisky tango: the drums take over, pounding out tribal rhythms and letting isolation and passion find common ground. And then there’s “Watanabe,” whose piano patterns rise and fall in geometric swells. Yet it’s when the band throws the formula off a bit, when the song just sputters out for a split second before rising back up, that it discovers the humanity in the technical. By the end, form is basically an afterthought as the song’s rhythms slow down into a peaceful slumber, and it’s as poignant a resolution as anything found on Tricolore. Like any debut act, though, Haiku Salut hasn’t completely worked out its kinks. “||: Lonesome George (Or Well, There’s No-One Like) :||” (yeah, I don't know what that means either) has charming elements but flies off the edge of whimsy when an awkward segue into marching band rhythms breaks the song’s sense of cohesion. The song also suffers from a lack of dimension, as does everything from its incomprehensible title to the smarmy accordion melodies. For the most part, Haiku Salut does a good job of grounding its more fantastical aspects, but the song feels like a mishmash of influences that never coalesce into a wholly relatable image. In Tricolore’s second half, Haiku Salut makes a smart choice and experiments with stripping things down to the essentials. “Six Impossible Things” begins promisingly, with a guitar melody that’s sparse but rich with implications. Unfortunately, the track weighs itself down with too much instrumentation: even when the song swings into a three-bar waltz, it all feels a bit too heavy. “Rusting Sense of Migration” wisely takes a different route, maintaining sparse instrumentation but layering each element to provide a sense of depth. Finally, “Glockelbar” plays with contrasts, the measured wheezes of the accordion and the thump of the kick drum set the song’s underlying emotional foundation while the lighter tones of the glockenspiel provide a foil. This trio of minimalist compositions may seem anticlimactic, but they’re necessary groundwork for the band, and the deviation suggests that even in its early stages, Haiku Salut is confident enough to take time and figure itself out. Besides, there’s a hell of a payoff to that groundwork on Tricolore’s two final tracks. “Train Tracks For Wheezy” is a slow burner at first. The piano and accordion tangle, the percussion rumbles in the background, and the strings cut in every once and again; while they’re all strong elements, nothing’s tying them together. By the time the song’s pared itself down to accordion and glockenspiel only, it feels like an unusually morbid note to end on—that is, before everything finally clicks into place and the track absolutely blasts off. The effect is positively radiant, as exciting as the moment of liftoff in a hot air balloon. It’s easily the defining moment of Tricolore—that is, until “No, You Say It” serves up a jubilant reply to the cryptic album opener, recrafting the original’s haunting glitch samples into an all-or-nothing dance-off. As it turns out, the path from loneliness to reverie is a surprisingly short one, and those who have been listening carefully will have known it all along. After all, isn’t that what poetry’s all about? All we have are the words, but there’s something in them that appeals to an ineffable part of ourselves. They build our dreams, power our ideas, and they make it just a little bit easier to bridge the gap from your side of the river to mine. If you ask me, that’s quite a long way to travel in just 38 minutes—but thankfully, we’ll always have soundsmiths like Haiku Salut to lead the way, voyaging into the abstract tangles of our everyday and finding something beautiful, something colorful, something real.